This afternoon, DOT released a bunch of data about Citi Bike ridership that gives some new insight into how New Yorkers are using the system, which covers Manhattan below 60th Street and parts of Brooklyn. The Citi Bike data also informs a new estimate of how many bicyclists are on the street in this part of the city. DOT estimates that on a typical day there are about 113,000 bike trips each day within the bike-share zone: 33,000 (29 percent) on bike-share, and the remaining 80,000 on private bicycles. 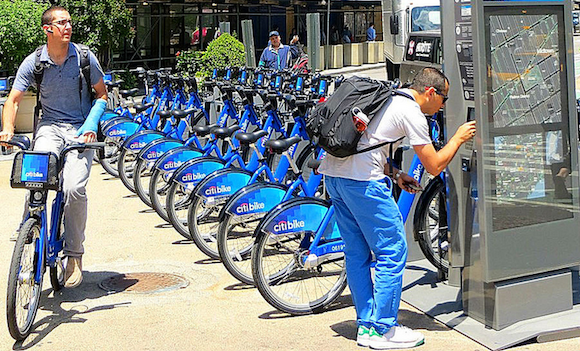 The estimate is based on DOT’s counts of Citi Bikes and other bikes at 10 locations within the service area in August, using the ratio to extrapolate the total number of non-Citi-Bike trips in the bike-share zone. Some context: The number of daily Citi Bike trips is about ten times higher than East River Ferry ridership, which served approximately 3,000 people a day in 2012. DOT noted that 113,000 trips per day is equal to the combined ridership of Manhattan’s two busiest bus routes — the M15 on First and Second Avenues and the M14 crosstown on 14th Street. It is also equal to 29 percent of the total number of yellow taxi trips originating within the bike-share service area, the agency says. Nearly two-thirds of users said they had replaced subway trips with bike-share and 63 percent said they have used Citi Bike when they otherwise would have walked. Trips by taxi, livery, and personal car were also replaced with bike-share: 21 percent of users said they have hopped on a Citi Bike instead of taking a car. Only 18 percent said they would have taken the bus, while nine percent said they would have used their own bike. Importantly, many trips are supplementing other modes, not completely substituting for them: 52 percent say they combine Citi Bike with other modes of transportation (like transit or taxis) some or most of the time. Citi Bike has also led New Yorkers to parts of the city they would not otherwise explore: 46 percent said they had used bike-share to go somewhere they wouldn’t have gone without it. Because the bike count data was calculated from the total number of Citi Bike trips, it offers the most solid estimate yet of total cycling activity within the bike-share zone. DOT’s regular screenline counts of cyclists at key points, such as the East River bridges, are best used for figuring out year-over-year growth trends, not total cycling activity. Based on survey and Census data covering the whole city, DOT estimates that there are 311,000 bike trips each day in the five boroughs (when combined with Citi Bike, that number rises to 342,000 daily), and that 54,000 of these bike trips, or about 17 percent, are to and from work. The agency says it used data from a 2011 Department of Health and Mental Hygiene survey and the 2009-2011 Census Bureau American Community Survey to arrive at these estimates. Getting a solid estimate of citywide biking has been a tricky problem to solve; we have a query pending with DOT about the methodology for the five-borough figures. Based on their results, DOH data indicated 4.9% of the adult population biked in last week. DOT used this percentage, the city’s adult population, the average number of biking days found in the DOH survey (3.47), and an estimated two trips per day to reach our estimate. אופניים בניו יורק? ועוד איך!